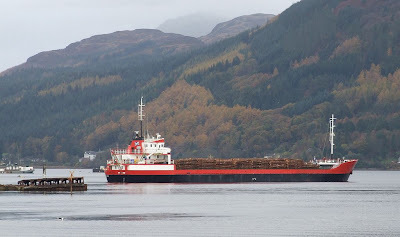 Captured just after leaving the berth at the Holy Loch Marina this afternoon, is Taylor and Taylor's RED DUCHESS, with a cargo of round timber bound for Londonderry. This ship, which was built in 1969, is possibly one of the oldest coasters engaged in the carriage of timber from Scottish ports. She was built by Scheepswerf Hoogezand, at Bergum in Holland, and has carried a multitude of names over the years. She joined Taylor and Taylor's Troon-based fleet in 2005, when she was given her present name. She is 75.7 metres overall, Her gross tonnage is 1,285 tons, while her deadweight is 1,359 tonnes.